The Chrysalis in Symphony Woods / Merriweather Park in the Inner Arbor plan. (Click for higher-resolution version.) Image © 2013 Inner Arbor Trust; used with permission. 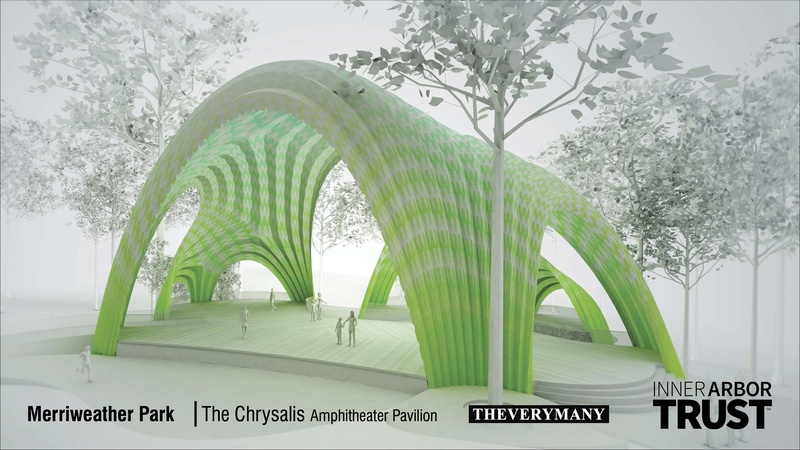 Marc Fornes, the designer of the Chrysalis, the amphitheater planned for Symphony Woods as part of the Inner Arbor plan, and his firm THEVERYMANY are one of two winners of the 2014 WAN 21 for 21 award sponsored by World Architecture News, “an initiative aiming to highlight 21 architects who could be the leading lights of architecture in the 21st century”. THEVERYMANY and 2014 co-winner sP+a (Sameep Padora + Associates) were selected from a total of 94 entries submitted, of which 42 were selected for more detailed consideration. The accompanying story notes that “As soon as Marc Fornes’ work was set on the table it was clear that a unanimous agreement [among the judges] was brewing” and quotes one of the architects judging the awards praising Fornes as “an absolute leader” and “the rising star of the 21st century”. Traditional architectural practice is based on architects conceiving of a structural form or set of forms in their minds, putting pen to paper to refine the design through drawings, and then using computers primarily as an aid to the rest of the process: creating more detailed drawings to nail down the final look of the structure and make sure everything will fit together as envisioned, doing structural analysis to see if the structure can handle loads, producing good-looking renderings for clients, and so on. THEVERYMANY turns that process on its head: Don’t use the computer as a simple drawing tool, a substitute for pen and paper. Use it for what it’s truly capable of, including exploring the space of possible three-dimensional structures. More concretely: Start with sophisticated 3D modeling applications (like Rhino, the one Fornes uses). Extend them with powerful programming languages that can be used to drive the 3D modelers (Fornes uses Python as implemented in Rhino). Leverage applications that can take complex 3-dimensional surfaces and join them together into structural elements and then into complete structures (see for example RhinoNest). Add code that can analyze such structures for soundness, and that can produce instructions for computer-controlled machinery to create individual pieces that can then be assembled into the finished structure. Finally (and most importantly), find people like Fornes and his associates who have the knowledge, discipline, and aesthetic sensibility to incorporate these techniques into the heart of their architectural practice. As the submission entry states, “The desire is not to generate models, nor installations, but rather 1:1 scale structures, prototypical architectures.” Fornes has been developing such prototypes for many years now, and “continually pushes constraints at larger scales”. The result of this work is the Chrysalis amphitheater as you see it here, a beautiful airy structure that looks as if it had emerged naturally from the earth. I hope it won’t be long before we see it in real life as part of Symphony Woods, replacing the temporary stage that’s been used this year during Wine in the Woods and other events. If all goes well it will be in place sometime next year, and Columbia can (as it did with Frank Gehry) once again boast of hosting the early work of an architect who seems destined for great things.